Composed by Nikolay Andreyevich Rimsky-Korsakov (1844-1908). Arranged by Lisa Lenke Sousa. Romantic Period, European. Individual Part, Score, Set of Parts. 23 pages. Published by Lisa Lenke Sousa (S0.343543). 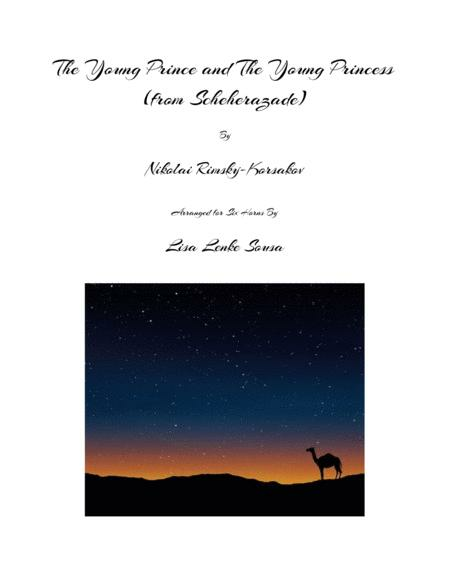 "2018 Chamber Music Contest Entry"
Composed by Nikolai Rimsky-Korsakov in 1888, Scheherazade is a symphonic suite based on One Thousand and One Nights, a collection of Middle Eastern folk tales compiled in Arabic during the Islamic Golden Age. This arrangement, from the third movement of the suite, called, The Young Prince and The Young Princess, is for a Horn Sextet.